Decide early on whether you will rely on the classic folded brochure or instead prefer a graduated fold. While it makes little difference with respect to the text and pictures you include, it does alter the room for available spacing a little. Funeral program templates can aid you in choosing just the right backdrop for your messages. Maintain the same font throughout the use of the brochure. While it may be necessary to change color fonts and play around with some of the sizing on the front page, the informational text should be in the same font. Mixing and matching too many sizes and colors detracts from the presentation. Place a photo of the decedent on the front cover. Make it a headshot that shows the person during healthy, happy times. Crop the image to take up approximately a third of the brochure’s front. Frame the outside of the brochure’s front page in a color that complements the main shade featured in the photo you used. For example, if your loved one wears a prominent hat in royal blue colors, the frame of the brochure should be in the same hue. Put the loved one’s full legal name under the photo. Include any nicknames in parentheses. Keep this information in all caps. Below this information put the date, time and location of the memorial service. You may choose to include the officiant’s name, if the decedent had a close relationship with the person. Place the decedent’s vitals — dates of birth and death — at the bottom of the brochure. Choose white fonts in the case of a dark border. If you encourage charitable donations to celebrate your loved one’s life, this is the place to offer this information discreetly to mourners. For example, if the decedent was an avid animal lover and strong supporter of a local animal shelter, you might specify that in lieu of flowers the family will appreciate donations in the loved one’s name to the shelter. Point out if there is a separate funeral service to be held after the memorial. Specify where, in the cemetery, mourners should go to attend. Note where the reception will be held after the funeral. This is also the space where you might indicate if the reception is only for close family members or open to all mourners. If you will conduct a symbolic goodbye, such as the release of doves, butterflies or balloons, indicate so on the back cover as well. Publish your loved one’s obituary in this space. If you placed one in the local paper, you may choose to use the same one. This is the spot reserved for the actual order of service. It is here that you highlight the readings, prayers and songs. Opening hymn; in the alternative, you might consider reciting a short poem that you associate with the life of the decedent. Be sure to list its words in the order of service. Welcome; this is usually offered by the officiant, who may be a spiritual leader or family member. Prayer or hymn and slideshow; if you desire a spiritually focused memorial service, this is the place to offer up prayers for the decedent, the family and friends. If you wish to make it not quite as religious, play recorded hymn music in the background while running a slide show featuring the loved one’s life. Personal memories; they are powerful reminders of the loved one’s impact on daily life. Discuss ahead of time with friends and family members to offer three to five minutes worth of memories each with the mourners. Allow sufficient time for this tribute. In fact, it should take up about three quarters of the allotted time. Prayer or hymn and dismissal. Once again, it depends on your personal taste if you wish to take a religious tone or keep it secular. Closing music is similar to the instrumental tunes you chose in the beginning. You might actually choose to use the same pieces. The order of service can only provide a loosely set scheduled that enumerates the aspects of the memorial. It is up to the officiant to guide mourners to the type of participation that is possible. For example, in the Catholic faith, the priest will invite the faithful to participate in a communion service. 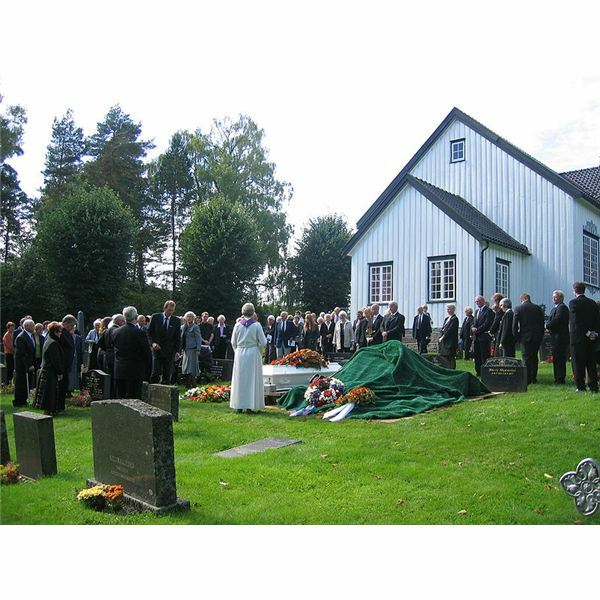 To compromise between a religious and secular funeral, consider keeping the memorial secular but holding a brief religious funeral service at the gravesite.